Hi there! I almost titled this post “Where did the weekend go?” It really flew by, kicking the weekend off with our first ever Mother-Daughter event, then Saturday morning was my monthly stamping club, the rest of Saturday is a blur- I did get my pedicure at long last, ah, my poor feet were sadly neglected this winter. I ran errands, and I finally got to sit down and drool over our new catalog. It is so much better than looking at it online… I have a very long wish list made out already. I can’t wait to show you all the fun new products! I spent a lot of time in the craft room…. My favorite room in the house! This card is one I’m featuring in clubs this month. I started to notice more demonstrators featuring cards they made with this technique. To me, it seemed a perfect technique to use with By the Tide, do you think it looks like a nice underwater scene? The three blues used are:Pacific Point on the bottom, Marina Mist on the top, and Tempting Turquoise in the middle. I cut up our stamping sponges into sections, and you sponge the color on whisper white card stock in a fast circular motion. 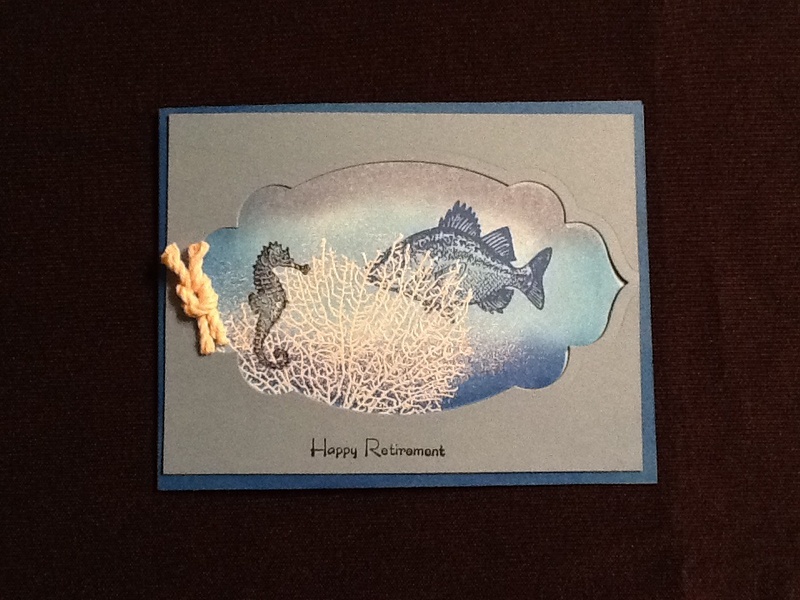 The sea horse is stamped in black Stazon ink, the fish in Pacific Point ink, and the coral was done in versamark ink, then heat embossed with pool party embossing powder. The mat is made with a piece of marina mist card stock, and the knots,are made with our retired,rope. Here’s a close up of the card, what do you think? 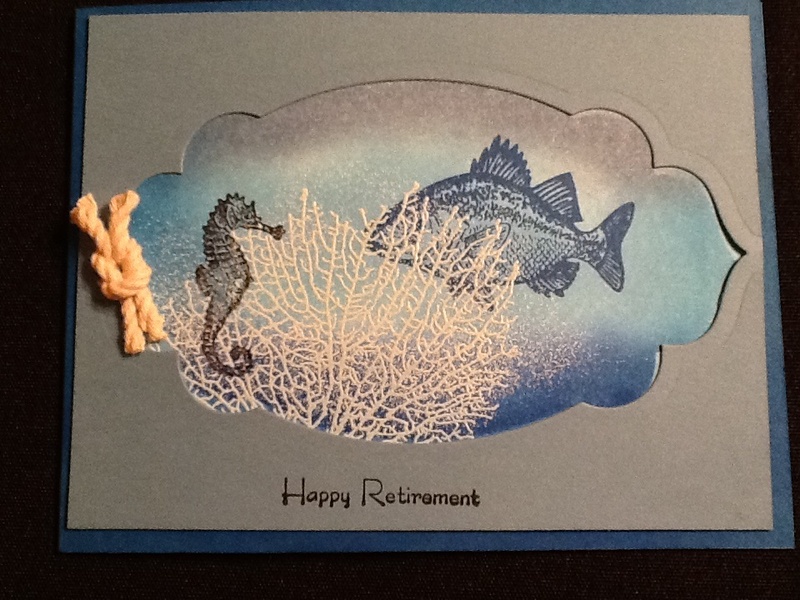 One of my staff is retiring tomorrow, and I made him this card. « Mother-Daughter Craft Night was a Great Success! !